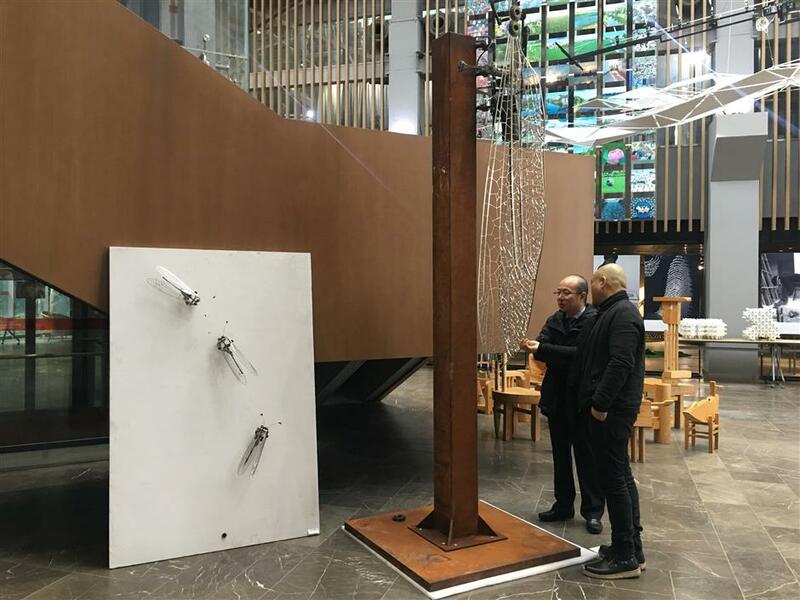 The 87 artworks are being exhibited free at the Shanghai Design Center at 488 Bansongyuan Road through January 22. Two experts admire the best artwork from the 87 exhibits. The creator of the work, a student from Hubei Institute of Fine Arts, made several metal cicadas whose wings wave slowly. The piece is called Midsummer. Over 80 outstanding sculptures and artworks created by art college students across the country are to go on show in the city. The 87 artworks have been chosen from over 1,100 candidates from 52 fine arts and design colleges. They are being exhibited free at the Shanghai Design Center at 488 Bansongyuan Road through January 22. After that, some will be moved to parks and street corners along Suzhou Creek, said Xie Lin, a senior expert with Shanghai Sculpture Commission and adviser to the biennial exhibition jointly organized by the Putuo District government and the commission. "The purpose of the exhibition is to decorate public areas with artworks from young artists as well as enhance the artistic quality of local residents," Xie told a press conference. Over a dozen sculptures selected through the biennial exhibition since 2010 have been exhibited in Changfeng Park and the riverside path along Suzhou Creek in Putuo. More outstanding artworks will be promoted citywide and in neighboring Yangtze Delta cities, Xie said. An expert panel including Xie and Yu also selected the best artwork from the 87 exhibits on Saturday. The winner was a student from Hubei Institute of Fine Arts who created several metal cicadas whose wings can wave slowly in an artwork named Midsummer. "Such artwork is quite suitable for public exhibitions that the citizens will enjoy and like it," said Sun Zhenhua, director of the Public Art Center in Shenzhen, Guangdong Province, another panel member. Shanghai once took a lead on the number and quality of public sculptures in China especially during the World Expo 2010 when a large number of modern sculptures were exhibited at the Expo site for global visitors, said Sun. However, with the shutdown of the Red Town creative park in Changning District this year along with its flagship attraction, the Shanghai Sculpture Space, the city lacks of major sites to exhibit sculptures to the public, Sun added. The biennial exhibition has become a platform not only for young artists to showcase their artworks but also promote the art of sculpture to the public, he said.